Bats have been long been known to carry rabies, but only in the past couple of decades have other bat-hosted viruses really gained our attention. Among the first, were the Hendra and Nipah viruses, which were first recognized in the 1990s (see Update: Hendra In Queensland, Nipah In Bangladesh). In 2003 the SARS-Cov (coronavirus) epidemic emerged - and while it was originally linked to civits, later recent research suggested civits were (at best) intermediate hosts, as SARS-like viruses have been found in bats around the world (see EID Journal: Novel Bat Coronaviruses, Brazil and Mexico). In addition to Ebola and Marburg, bats are also suspected to be part of the ecology of MERS-CoV (camels, like civits, may be secondary hosts). And in the past four years, bats have even been found to harbor several unique influenza viruses (see CDC: Bat Flu Q&A). When Steven Soderbergh made his pandemic thriller `Contagion’ a few years ago, technical adviser Professor Ian Lipkin created fictional MEV-1 virus based on a mutated Nipah virus (see The Scientific Plausibility of `Contagion’) simply because of the potential of someday seeing a bat-borne pandemic virus. The list of potentially zoonotic viruses that bats carry grows every year, and a couple of months ago, in Study: Hotspots For Bat To Human Disease Transmission, we looked at a study that attempted to quantify the risks of zoonotic transmission of a wide variety of bat viruses to humans. All in all, its a pretty good time to be a Chiroptologist (a scientist that study bats). All of which brings us to a new study - published yesterday in PNAS - from researchers at UNC Chapel Hill, that looks at a coronavirus isolated from Chinese horseshoe bats, that already seems to have much of the `right stuff' needed to infect, and replicate, in humans. Outbreaks from zoonotic sources represent a threat to both human disease as well as the global economy. Despite a wealth of metagenomics studies, methods to leverage these datasets to identify future threats are underdeveloped. In this study, we describe an approach that combines existing metagenomics data with reverse genetics to engineer reagents to evaluate emergence and pathogenic potential of circulating zoonotic viruses. Focusing on the severe acute respiratory syndrome (SARS)-like viruses, the results indicate that the WIV1-coronavirus (CoV) cluster has the ability to directly infect and may undergo limited transmission in human populations. However, in vivo attenuation suggests additional adaptation is required for epidemic disease. Importantly, available SARS monoclonal antibodies offered success in limiting viral infection absent from available vaccine approaches. Together, the data highlight the utility of a platform to identify and prioritize prepandemic strains harbored in animal reservoirs and document the threat posed by WIV1-CoV for emergence in human populations. The entire paper is available for reading online, and is well worth the time. Cutting to the chase a bit, we also have a press release from UNC on this study. (Chapel Hill, N.C. – March 14, 2016) – A SARS-like virus found in Chinese horseshoe bats may be poised to infect humans without the need for adaptation, overcoming an initial barrier that could potentially set the stage for an outbreak according to a study at the University of North Carolina at Chapel Hill. The work, led by Ralph Baric, Ph.D., professor of epidemiology at UNC’s Gillings School of Global Public Health, comes on the heels of two recent high-profile outbreaks – Ebola and Zika – for which there are no vaccines. The two outbreaks combined claimed thousands of lives and cost billions in foregone economic growth. Baric and Menachery worked with SARS-like coronavirus sequences isolated from Chinese horseshoe bats, where SARS originated. Based on the sequences, they reconstructed the viruses to evaluate their potential to infect human cells and in mice. They found that the newly identified virus, known as WIV1-CoV, could bind to the same receptors as SARS-CoV. They also showed that the virus readily and efficiently replicated in cultured human airway tissues, suggesting an ability to jump directly to humans. As bats are the most abundant and geographically dispersed vertebrates on earth, their ability to carry and vector dangerous diseases without ill-effect (i.e. 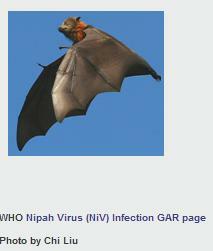 Rabies, Nipah, Hendra, even influenza) is increasingly viewed as a potential public health threat. None of this is meant to demonize bats, as they are an important part of our environment (they even eat mosquitoes). Still, the CDC offers some sage advice when it comes to avoid coming in contact with bats.